The fall-winter EDUlib season, from November 14, 2016 to February 15, 2017, will feature two new free online courses. Promouvoir la santé et l’efficacité au travail, taught by Professors Estelle Morin, Caroline Aubé and Kevin J. Johnson, will take participants into the heart of a business by turning the spotlight on individuals and work teams as it addresses workplace health and efficiency. The five-session course will look at individual work psychology (personality, intelligence and affectivity) and interpersonal dynamics (social influence and group effectiveness). A second course, Le management, is intended for anyone looking to better understand management theory and practices. Full-time Lecturer Gilles Cazabon will draw on various real-life examples and have participants look at management from three complementary perspectives (formal, charismatic and traditional). All the teaching materials will be available as soon as the courses open on November 14 and participants can complete the various activities at their own pace. EDUlib courses are always free. A certified attestation will be available from the HEC Montréal École des dirigeants, at a cost of $50, to all students who have successfully completed the various activities by the end of the course. The attestation indicates the number of training hours and the number of continuing education units. 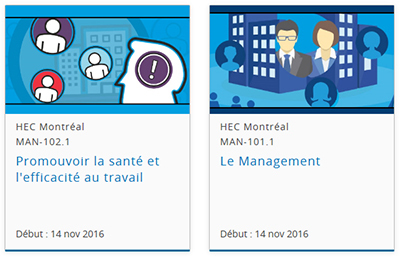 Three ongoing courses will also be available: Introduction au marketing, by Professors Johanne Brunet and Yannik St-James, Gestion des conflits, by Professor Jean Poitras, and Réussir son démarrage d’entreprise - L’approche SynOpp, by Full-time Lecturer Claude Ananou. For HEC Montréal, Polytechnique Montréal and the Université de Montréal, EDUlib is an excellent way to reach a broad audience and share the knowledge they already provide for their students from Quebec, elsewhere in Canada and around the world. All the EDUlib courses are designed and taught by professors from the three institutions and their partner universities worldwide.